Volunteering is a value long entrenched in American life. The very structure of the United States government lends itself to citizens’ self-organization, while the altruistic desire to serve others directs volunteer activity. As a result, one in four Americans volunteer. Americans of all ages volunteer in the sport and recreation sector, with young people and older adults leading the way. Yet, altruism as the core component of volunteer efforts no longer stands alone. Instead, Americans volunteer for a plethora of reasons, some of which blur the traditional expectations that volunteering is both voluntary and uncompensated. 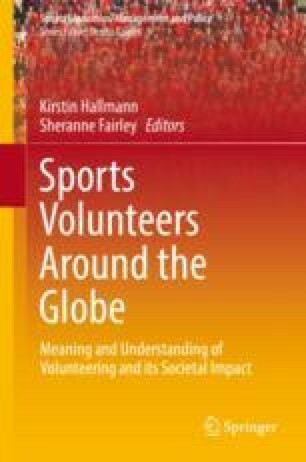 The emphasis on commercialization throughout the United States sport system is changing the traditional perceptions of volunteering and impacting on the types of volunteer experiences provided. Aspen Institute. (2018). Project play. https://www.aspenprojectplay.org. Accessed 30.08.2018. Benjamin Franklin Historical Society. (2014). Union fire company. http://www.benjamin-franklin-history.org/union-fire-company/. Accessed 30.08.2018. Corporation for National & Community Service. (n.d.). Volunteering and civic life in America. https://www.nationalservice.gov/vcla. Accessed 30.08.2018. COSMA. (2015). Home. https://www.cosmaweb.org. Accessed 30.08.2018. Education Commission of the States. (2018). High school graduation requirement or credit toward graduation – service learning/community service. http://ecs.force.c. Accessed 30.08.2018. National Recreation and Park Association. (2018). COAPRT standards. https://www.nrpa.org/certification/accreditation/coaprt/coaprt-standards/. Accessed 30.08.2018. NCAA. (n.d.). Personnel management and sports oversight. So you want to be an AD. https://www.ncaa.org/governance/personnel-management-and-sports-oversight. Accessed 30.08.2018. New York Road Runners. (2018). TCS New York Marathon: Volunteers. https://www.tcsnycmarathon.org/volunteers. Accessed 30.08.2018. Pedulla, T. (2018, January 28). The price for super bowl volunteers. The New York Times. https://www.nytimes.com/2014/01/29/sports/football/use-of-volunteers-questioned-as-nfl-revenue-soars.html. Running U.S.A. (2018). U.S. road race participation numbers hold steady for 2017. https://runningusa.org/RUSA/News/2018/U.S._Road_Race_Participation_Numbers_Hold_Steady_for_2017.aspxSpencer. Accessed 30.08.2018. Spencer, W. (2014, February 16). Volunteering is a core American value. Huffington Post. https://www.huffingtonpost.com/wendy-spencer/volunteering-is-a-core-am_b_4453224.html. Accessed 30.08.2018. St. George, D. (2015, April 5). High school seniors in mad scramble to finish community service. The Washington Post. https://www.washingtonpost.com/local/education/high-school-seniors-in-mad-scramble-to-finish-community-service/2015/04/05/35aa73b8-d943-11e4-ba28-f2a685dc7f89_story.html?noredirect=on&utm_term=.41bd2019463b. Statista. (2016). Number of running events in the U.S. from 2012 to 2016, by distance of race. https://www.statista.com/statistics/280485/number-of-running-events-united-states/. Accessed 30.08.2018. United States Census Bureau. (2018). Data. https://www.census.gov/data.html. Accessed 30.08.2018. Volunteerism U.S. (2018). New dictionary of the history of ideas. http://www.encyclopedia.com/history/dictionaries-thesauruses-pictures-and-press-releases/volunteerism-us. Accessed 30.08.2018.